Home › Ladycolour "Venus" Shooting Star & Hollow-Out Design Heart Sapphire Pendant N..
Ladycolour "Venus" Shooting Star & Hollow-Out Design Heart Sapphire Pendant N..
LadyColour "Venus" Shooting Star & Hollow-out Design Heart Sapphire Pendant Necklace, Made With Swarovski Crystals, Engraved With "I Love You To The Moon and Back"
Specifications: 1.Chain Length:16" plus 2", Pendant Height: 1", Width: 9/10".| 2. Stone: Crystals from Swarovski. Stone Color: Bermuda blue. 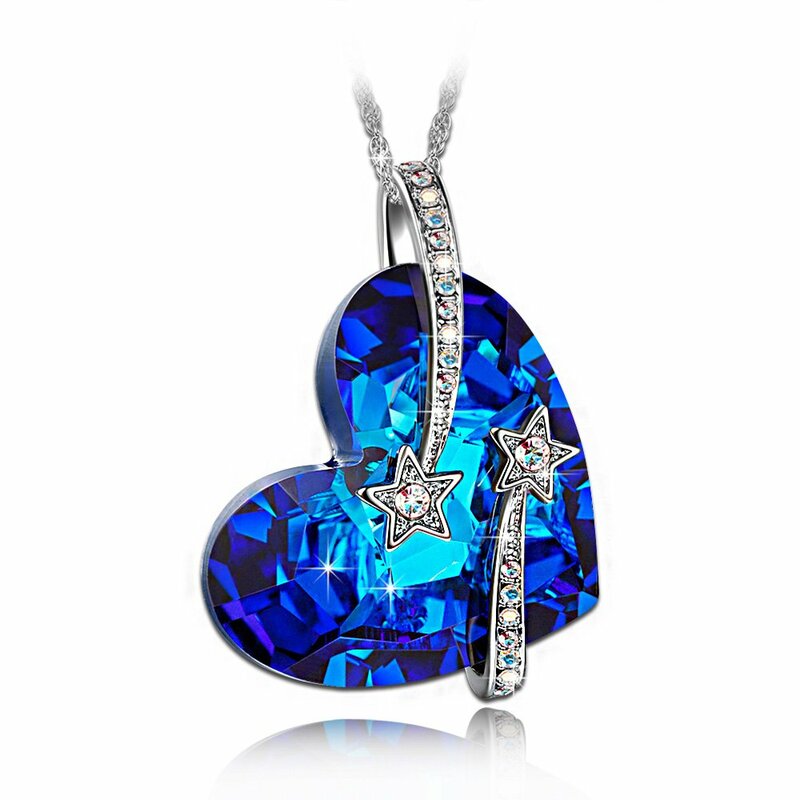 | 3.Eco-friendly Rhodium Plated Zinc alloy,Lead-Free & Nickle-Free,Passed Swiss SGSInspection Standard.Women, being from Venus, have a reputation for being thefirst to spring "I love you" in romantic relationships.Heart-shaped symbolsare synonymous with "LOVE",it's absolutely a great gift for you to expressyour love.This "Venus" Jewelry made with crystals from Swarovski,which makesthis women jewelry sparkling,elegant and absolutely eye catching,this on-trendsilhouette demonstrates Swarovski's craftsmanship at its best.Swrovskicrystals add infinite brilliance to everything they embellish.LadyColourJewelry is committed to providing the best jewelry and customer service to ourcustomers,your feedback is our motivation to improve.We strive for your fivestar feedback.To keep up with our latest items,sales and promotions,add thiselegant jewelry to your Wish List.Thank you.LadyColour Jewelry care tips:Rubyour LadyColour Jewelry with baby wipes:they perform miracles on crystaljewelry.Then rub with a clean dry soft cotton cloth to bring back theshine.Put it inside a soft cloth pocket or fabric swath,avoid it from rubbingagainst other jewelry.LadyColour Jewelry Designing Philosophy:1.Every woman isan innocent child.They are eager to feel the brilliant and beautiful world.Bebrave to pursue the beautiful fairy tale in your heart,because it is theprivilege of being a woman!2.Jewelry itself has no value,but the jewels whichcan make women shining are priceless!3.Ordinary jewelry is mundane.Elegantjewelry is noticeable and memorable.Crystal jewelry is worn and adored bywomen all over the world.You could click on "LadyColour Jewelry" to see ourother jewelries,there are more affordable and beautiful designs for yourchoice.Thank you.